The South Pars/North Dome Gas-Condensate field is the largest natural gas field in the world. Natural gas is generated through the same process of geological thermal cracking which produces petroleum from kerogen. Consequently, oil and natural gas are frequently found together. A natural gas field is a deposit rich in natural gas. Nearly 80% of the world’s natural gas fields are located in ten nations. Russia’s reserves alone account for almost a quarter of the total global gas reserves and also holds two the largest fields: Urengoy and Yamburg. Iran and Qatar share ownership of the largest natural gas reserve in the Persian Gulf. Discovered in 1971, the South Pars natural gas field is the largest deposit of natural gas ever discovered. Estimations from the International Energy Agency (IEA) hold that South Pars alone has as many recoverable reserves as all known gas fields put together. The field has a capacity of about 1,800 trillion cubic feet of gas and condensates of about 50 billion barrels. South Pars is the name given to the Iranian part of the gas field whose area is about 1,400 square miles under Iran’s territorial waters. North Dome is 2,300 square miles in size located in Qatari territorial waters. Ranking second globally by capacity and size is the Urengoy gas field. This gas field is found in the north of the West Siberia Basin. The field’s capacity has been estimated to be around 222 trillion cubic feet in total deposits. This field was discovered in 1966, and on July 6 the same year the first drilling hole reached the gas deposit. Production from the field however only kicked off twelve years later in 1978. 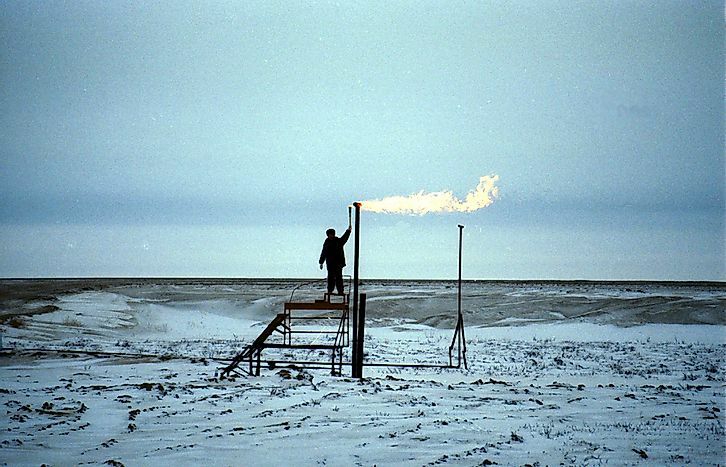 The Urengoy gas field churns out roughly 9.2 billion cubic feet of gas and more than 825,000 tons of oil every year. Yamburg ranks third among the largest gas fields by capacity. It holds about 138 trillion cubic feet. This gas field is also located in Russia’s West Siberia Basin about 92.3 miles north of the Arctic Circle. The Yamburg field covers an area of 3,410 square miles. Discovered in 1969, development on the Yamburg field kicked off in 1980 for production to begin six years later in 1986. In the list of the top ten largest natural gas deposits in the world, Russia has three fields in addition to Urengoy and Yamburg. The fourth largest gas field, Hassi R’Mel is located in Algeria and has a capacity estimated to be about 123 trillion cubic feet. The Hugoton field in the US, the Galkynysh in Turkmenistan, and the Groningen in the Netherlands also rank in the top ten largest gas fields in the world. These fields have recoverable reserves of more than 70 trillion cubic feet. Continued oil and gas exploration has led to the discovery of new oil and gas fields some with significantly vast capacities, for example, the Zohar in Egypt which was discovered in 2015 has a capacity of at least 30 trillion cubic feet.